Today’s a day for a video by a pretty famous guy, Ashwath Damodaran. It’s a 25 minute video – and worth every minute of it. But, as is usual, I have to add my little 2 paise. The first point he says is: Companies must act their age. As in, a young company shouldn’t take debt and focus on growth. A mature business must build more margins and profit. A declining (retiring) business should focus on paying out dividends. If businesses don’t act their age, it’s dangerous for investors. Walmart, he says, is getting the world’s most expensive facelift in buying Flipkart. And that Walmart’s gonna get hurt. Actually, he’s probably right if his assumption was that Walmart was buying Flipkart to make money. I don’t think that was the motivation. 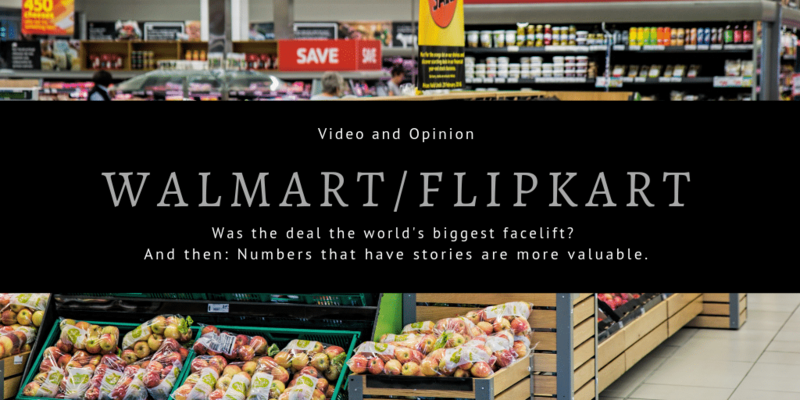 Walmart’s been trying to do the thing it does best – sell stuff to people – and venture into India because all its other markets are saturated. India’s rebuffed it many times, first by disallowing FDI into retail, and then having it partner with people who’ve siphoned off way more than their pound of flesh. What Flipkart is, is really FDI in retail, disguised as, well, Flipkart. Flipkart is officially a marketplace where other people sell stuff. Walmart is too. Walmart runs the store. They rent out the shelf space to the manufacturers. Flipkart owns the warehouses on which sellers keep their inventory so that Flipkart can track it, ship it and handle returns. They rent out the space to the sellers. And do strange things with GST to make it look like they are not Flipkart. But Flipkart has the inventory, it effectively ships the product, it collects the money from the customers, it takes on the refund issues, etc. This is what anyone would call a retailer, but no, they are a marketplace. What Walmart is doing, looks entirely like a facelift (“e-commerce!”) but it seems to me like they’re buying into a well-oiled back-end serving nearly all of India, just that it’s only online so far. They’ll eventually be allowed to set up stores, as we will ease the FDI policy too. And then, the back-end investment will quickly be able to service all the physical stores too. Amazon will never open physical stores, and in India the bigger opportunity is in physical stores for the next decade. For a very large, growing economy, this deal is all about Walmart acting their age. Ashwath talks about one more thing: that numbers alone don’t make sense. It’s gotta have a story. A story that tells you why. Or what. Or how. The numbers don’t cut it. Recently, there’s been a concern about numbers, in a company called Jamna Auto. That oh, their debt went up like crazy! That’s because it’s up from the March quarter. But if you look carefully, this is their situation every September. Their debt goes up in Sep, and they bring it down by March. This is normal – and possibly part of a working capital arrangement with their customers (Jamna is India’s largest leaf spring manufacturer with enormous market share in commercial vehicles). They just get paid later. And then, their receivables are up big time! But not really. Again, last year in September, as a % of sales, receivables are roughly the same (about 25% of half year sales, or 13% of full year sales). This high receivable cycle has to be funded of course, which is why Jamna has higher working capital based debt. A high receivable cycle is questionable of course, but if your customers are big players and you have large market share, it’s likely you have to work with their constraints regularly as well. If you look carefully in their balance sheet, some of the receivables were sold (“factored”) to a bank – this is common because the bank is happy to take a Rs. 100 receivable at Rs. 90 and earn the excess as higher interest when it knows the receivable is secure, and the company is happy because it gets cash to pay down higher cost debt. This should be even more common – that’s why the RBI set up the concept of TREDS. Jamna’s customers (it has 70%+ market share) are the big boys of India’s commercial vehicle market, from Tata to Ashok Leyland. When banks take over those receivables, effectively, the Tata/Ashok Leylands owe the banks the money instead, because banks pay Jamna upfront – a lesser amount – for them. This arrangement seems to have been confused for a “fire sale” of receivables, so an analyst makes a call that something is really wrong. If you believe that, you’ll say Jamna’s hiding something. But the numbers are one thing – the story is another. How you read your story is different from someone else. In previous years, Jamna’s done this for its suppliers as well – get a longer payable period by asking its own suppliers to factor its receivables. These are “acceptances” and recorded as trade payables (correctly so – they may be payable to a bank, but it was against items received from a supplier, and the supplier pays the interest). Factoring is a brilliant way for customers to increase their payable cycles, while suppliers use it to get cash earlier. The financier gets interest, and the interest is borne by the supplier, not the customer. But if you choose to read the story as: Factoring is evil because how dare a company settle for less than the amount it could receive – then your interpretation will be different. Not saying Jamna’s perfectly clean, but to provide context around the numbers. Some will find it believable, some won’t, but without the story, the context is lost. Disclosure: We have a buying interest in Jamna Auto, so please assume bias.